Having to deal with neck pain all day can be really frustrating. It makes each your activity difficult and painful to perform leading to even more severe health issues day by day. However, investing in the best pillow for neck pain can help prevent or reduce your neck problems and improve your sleep each night. It’s not that easy to choose the right pillow since there’s a ton of things you need to consider first. Some of the factors we paid attention to in our evaluation include the pillow shape, materials, and firmness. 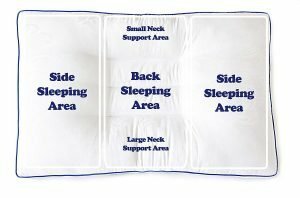 Sleeping positions and cover material are some of the other main factors we looked at when reviewing the top neck pillows on the market. It took days of going through more than a thousand customer reviews and conducting expert researches to narrow down the list. We’ve included a comparison table below to give you a quick summary of our seven favorite options. It’s followed by an in-depth review of each pillow and a detailed buying guide. Hopefully, once you are done reading this article, you will be well informed about neck pillows and be able to select the right pillow without any hesitations. One of the major highlights of the Coop Home Goods is its premium quality foam. It’s a finely shredded elastic memory foam that’s soft but very supportive. It conforms nicely to the shape of your neck and head providing ample support and comfort. 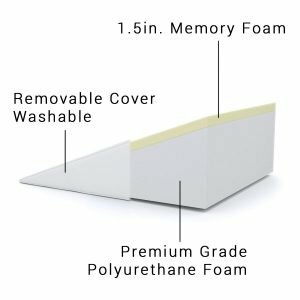 The zippered cover provides full access to the foam and considering that it’s finely shredded filling, you can adjust it to suit sleepers of different sizes and shapes. 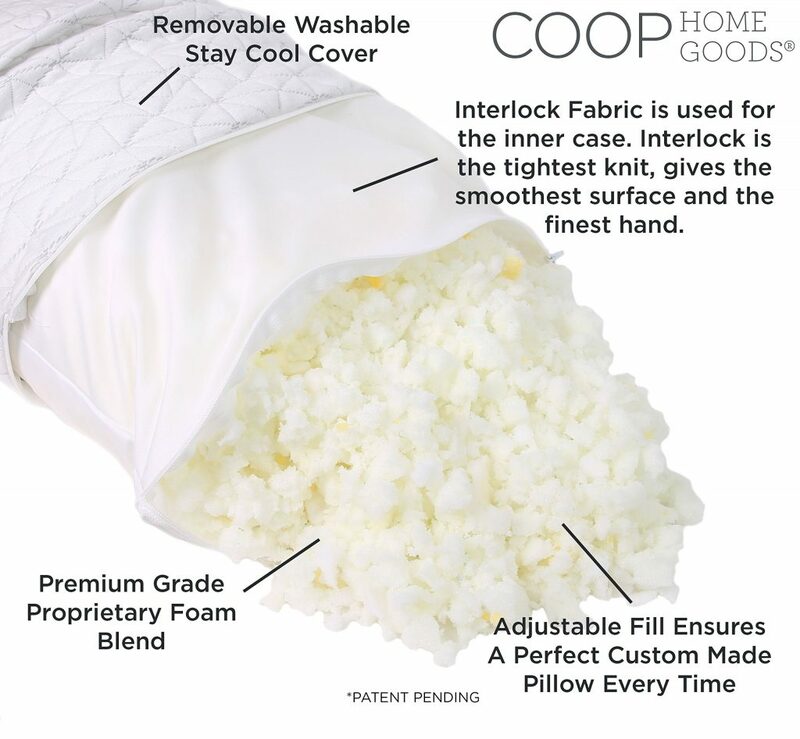 Another nice thing you are bound to like about this Coop pillow is that while it may start to flatten after using it for a while, you can easily re-fluff it to its initial form. Thus you get optimal support and comfort throughout. The foam is very durable, and it will take some time before you can think of replacing it. 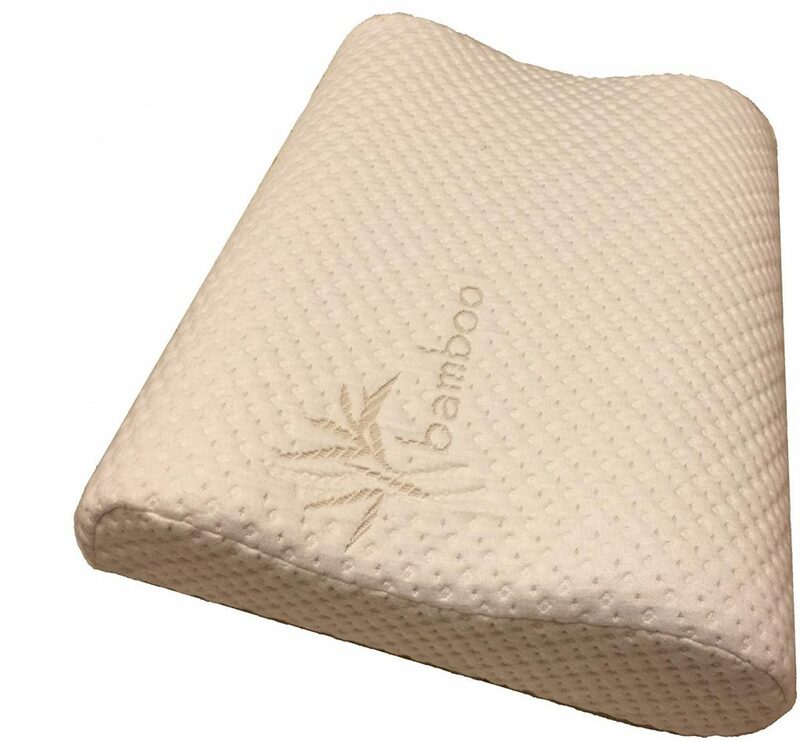 The bamboo cover is of high quality too and has a nice, plush feeling. It’s highly breathable and combined with the small, shredded particles of the memory foam, facilitate greater airflow within the pillow. 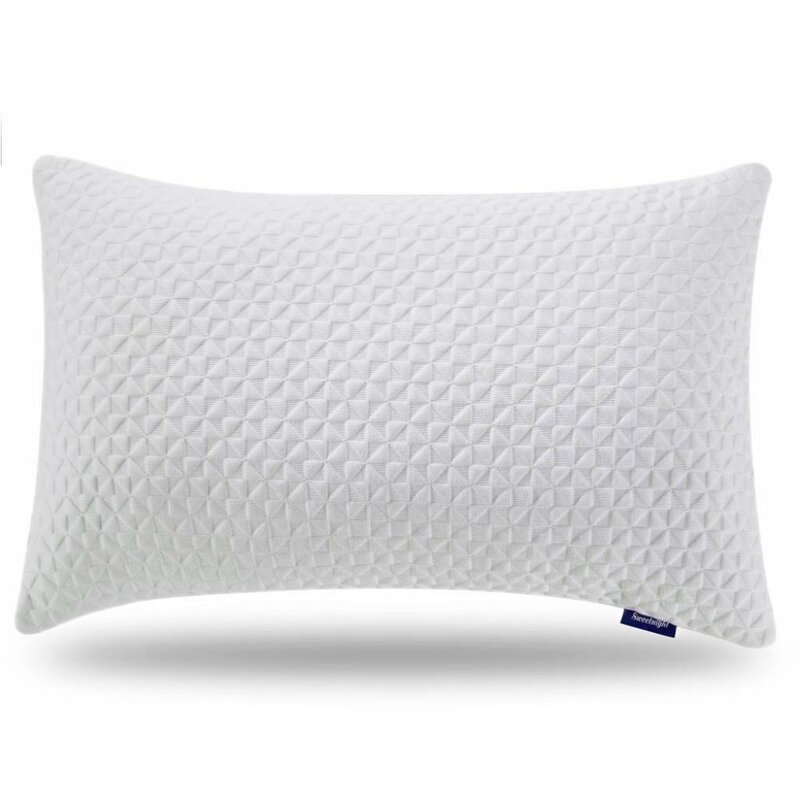 You won’t end up getting allergic reactions too while using this pillow because it’s hypoallergenic and dust mite resistant. All in all, this is a highly effective and durable neck pillow for the money. 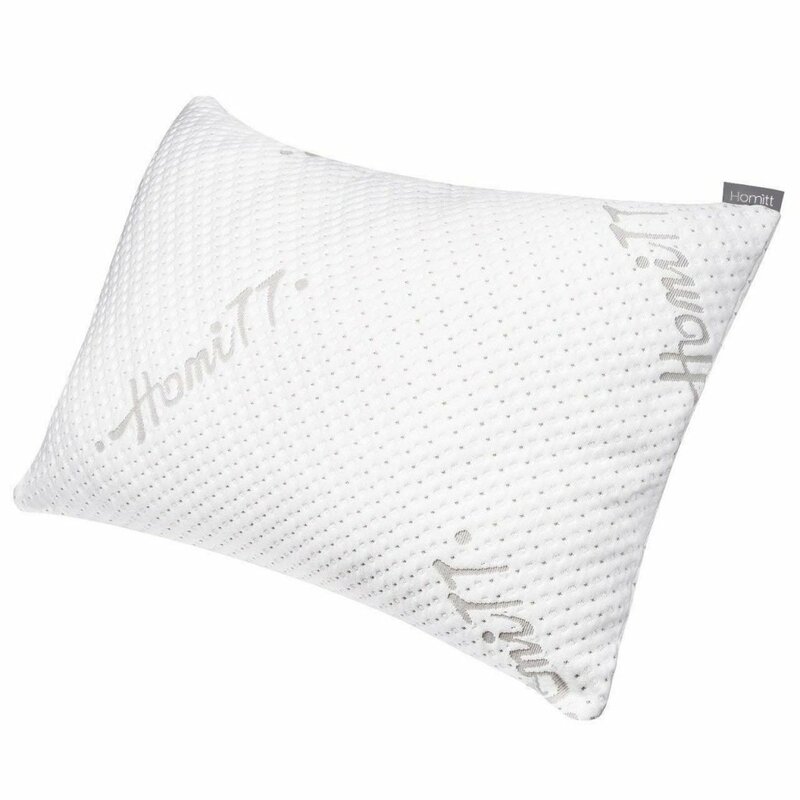 The top highlight of this Nature’s Guest’s pillow is its contoured design with gusseted edges. It boasts an in-built roll cushion to give your neck the desired support when sleeping on your back. It’s spacious enough to accommodate all types of head sizes, and you can even move around comfortably. The side lobes are also quite large and comfortable for side-sleeping. Another commendable feature is the fact that you can adjust the pillow to your desired firmness or personal preference. 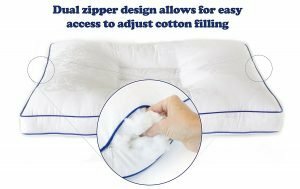 There are zippers on either side which open to give you full access to the pillow filling. You can add or remove the filling according to your needs for both side and back sleeping areas. All the materials used in making this Nature’s Guest pillow are natural. 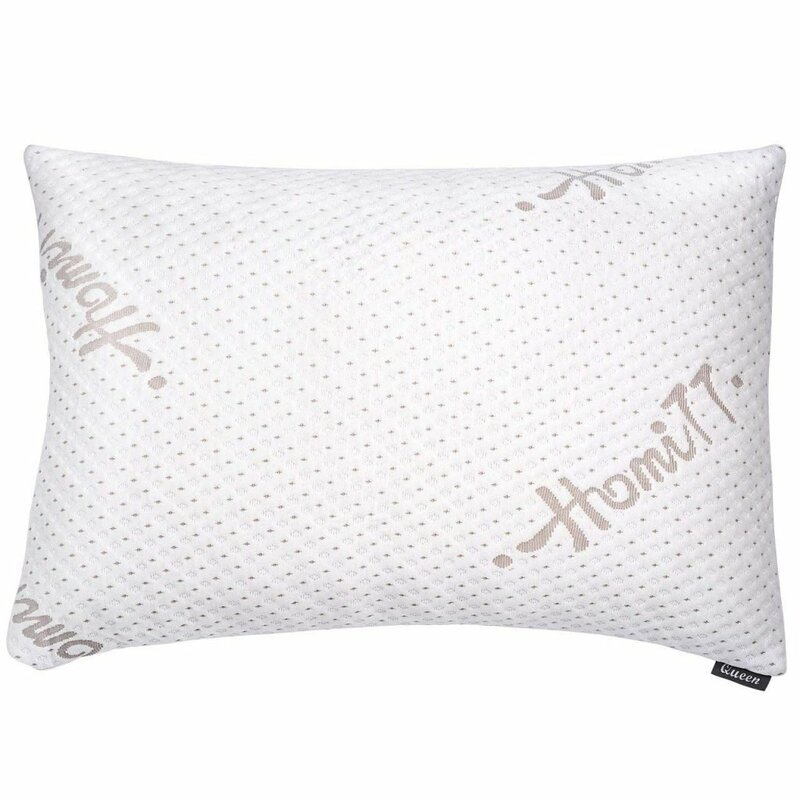 The filling material which is a combination of cotton and wood pulp fibers adds density and weight to this pillow. Therefore it’s not fluffy, but has a soft, comfortable feel and provides sufficient support. It’s quite breathable too so you won’t feel stifled by the pillow when taking a nap. The cover material is pure cotton, and it’s equally soft plus you can easily remove it for cleaning. 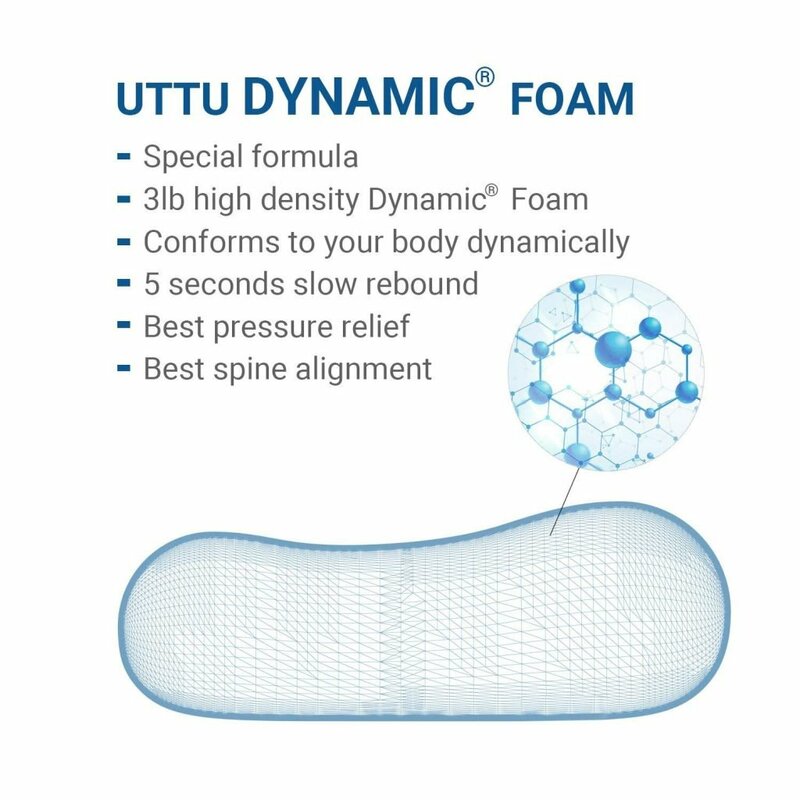 The memory foam filling of this UTTU Sandwich pillow is very soft, and even though it’s not shredded memory foam, it nicely conforms to the natural shape of your body. The pillow is designed to support all types of sleepers. It has a 4.7-inch high contour on the upper side which is ideal for side sleepers and a 3.9-inch low contour on the bottom side which is much suitable for stomach and back sleepers. One thing you will also appreciate with this UTTU pillow is the fact that it’s adjustable. 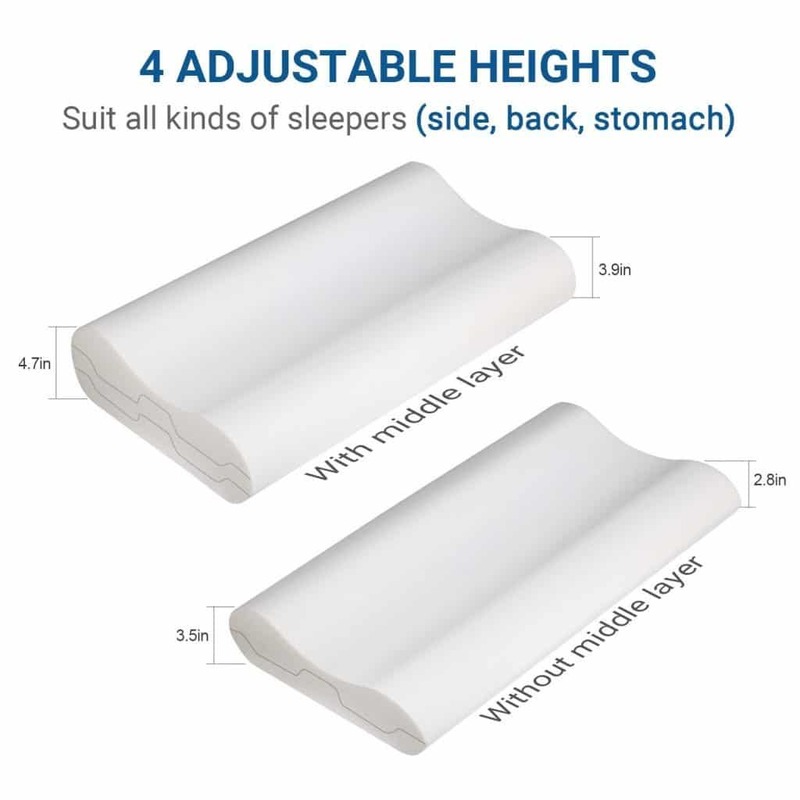 You can remove the middle layer of the pillow if you are not comfortable with the height which means you can customize it can accommodate almost anybody. The quality of the foam is also quite decent. It’s soft and holds up pretty well under varying temperatures. It’s a good quality memory foam that will retain its firmness and fluffiness for years to come. The cover material has a soft feel in the skin, and it’s hypoallergenic which makes it safe for use even by those suffering from allergies. 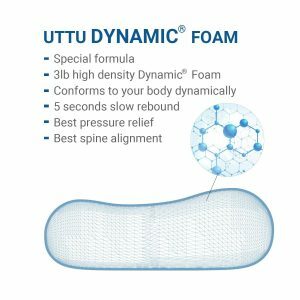 To sum it all up, the UTTU is another well-built and dynamic pillow that’s designed to provide support to all types of sleepers. Bed Wedge from FitPlus is one of the few wedge pillows that have been specially designed to help eliminate shoulder and neck stress as well as aid in a number of other health problems. You can even use it to elevate your legs so as to promote circulation. 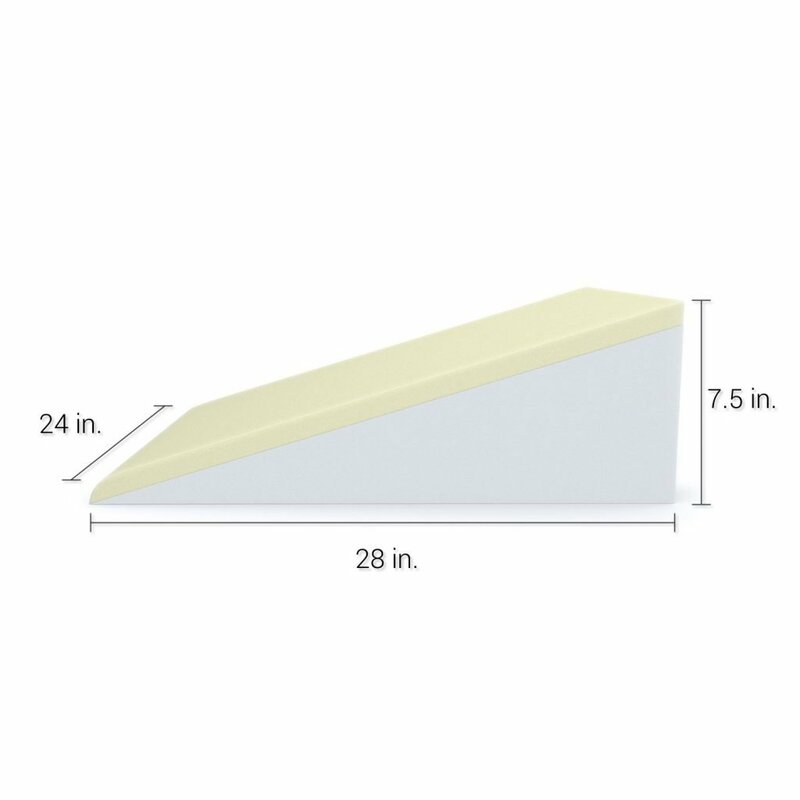 The pillow has a classic wedge shape with a slope that’s 28 inches long. The surface area is also wide and can accommodate different kinds of sleepers. The slope is gentle hence does not exert any pressure on your muscles. 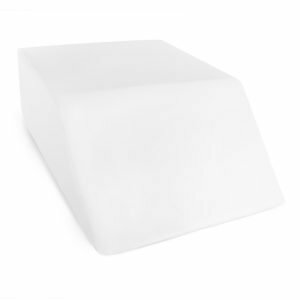 The base of the pillow consists of a dense polyurethane foam while the top is made up of 1.5-inch memory foam. 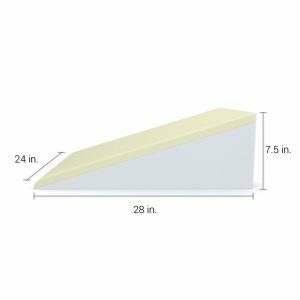 The whole construction provides a firm yet comfortable level of support. The top memory foam molds to the contours of your head, neck, and shoulders. It does facilitate a soft and strong support. The other great thing about this wedge pillow is the soft cover it comes with. It very breathable thereby can help keep you stay cool when it gets a little hot in the night. 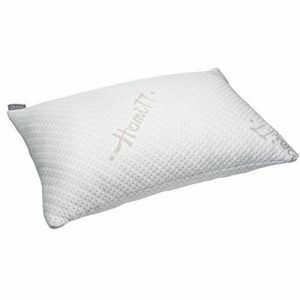 This orthopaedic-shaped Perform pillow does provide the head and neck with enough support and comfort. There is a nice softness to the stuffing despite it being a solid memory foam. Although it feels a little firm, it does hold your head comfortably, thereby you get a more relaxing support. 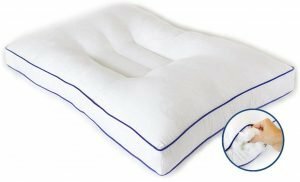 The pillow features a contoured shape which makes it more ideal for back and side sleepers, but if you are a stomach sleeper, it might feel slightly uncomfortable. What makes it stands out is the fact that it’s very eco-friendly. The foam does not contain any chemicals or heavy metals that might be toxic to your health. 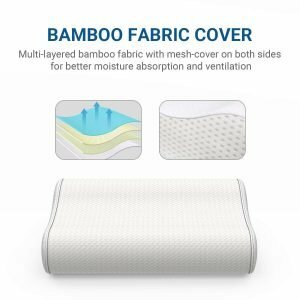 Furthermore, the cover and pillow are both hypoallergenic and dust mite resistant which makes it a perfect option for people with allergies. The bamboo based cover is a micro-vented fabric. It feels cool and smooth to the touch. Although the foam is solid, this micro-vented cover is quite breathable and allows sufficient airflow to keep you cool during a hot night. 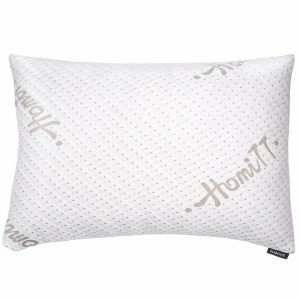 If you are looking for something more budget-friendly, but still offering great support and comfort while sleeping, then the Homitt Shredded Memory Foam pillow is a nice choice. The custom made shredded memory foam is soft and elastic. It maintains a well-balanced pressure and support between the head, neck, and shoulder. 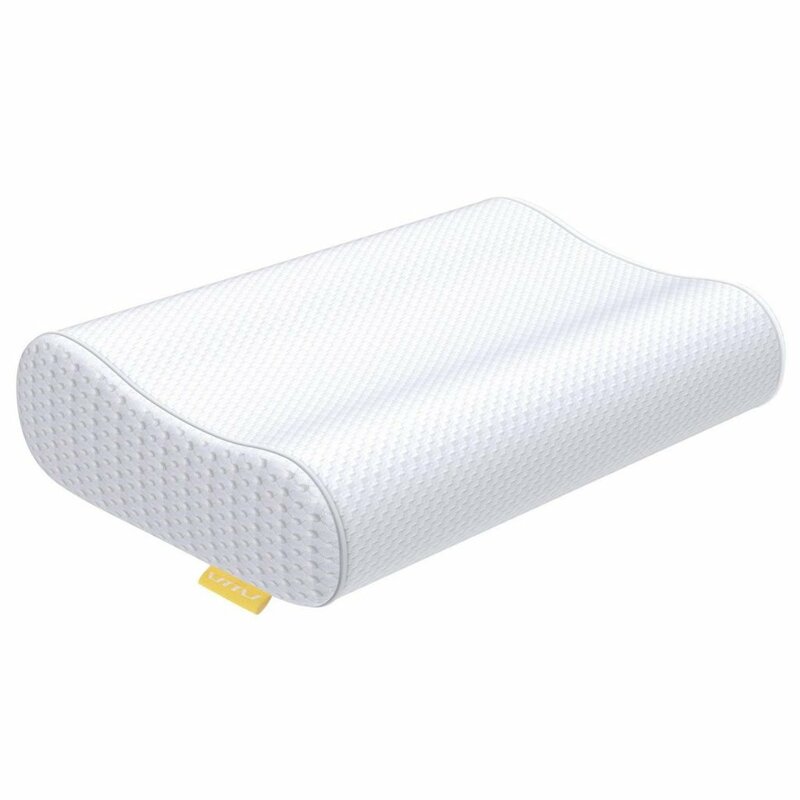 The foam is very comfortable and also quite firm so that your head doesn’t sink into it while sleeping. The best part is that it’s compressed packed, so there is no deformation after a long time of use. 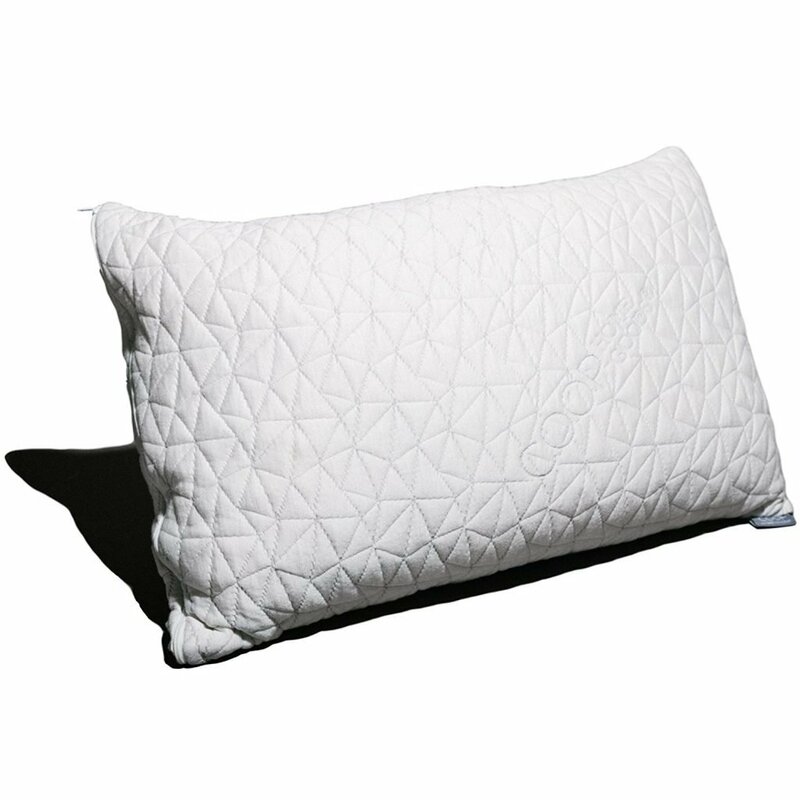 Once you wake up, it only takes around 15 minutes for the pillow to recover its original shape. You can also add or remove the foam to adjust the height to your comfort or based on your sleeping position. The cover is a combination of 60% polyester and 40% viscose rayon that’s derived from bamboo fiber. It’s soft and highly breathable. Together with the shredded filling, the pillow offers excellent airflow, and as such, it will keep you cool throughout the night. 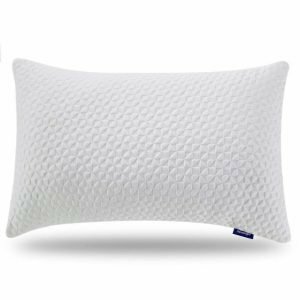 While it has a simple, traditional lozenge shape, this Sweetnight pillow is one of the most customizable neck pillows on the market. The basic two-zipper, two-layer design of the pillow makes it easy to endlessly adjust it to suit any sleep position. 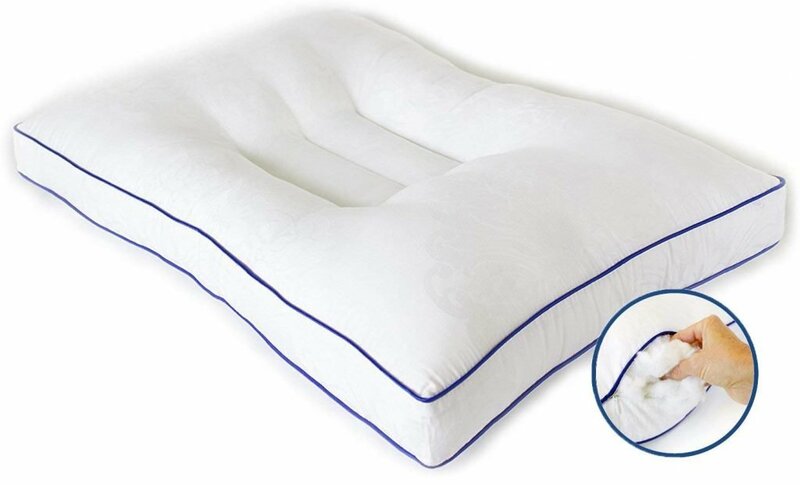 You can add and remove the foam until you achieve the level that feels most comfortable to your sleeping position. The filling does not lose its elevation when you adjust it and contours nicely around the shape of your neck and head. Even when you toss and turn in your sleep, the filling conforms to your head and body position thereby keeping your neck and spine balanced and properly aligned. The outer cover, on the other hand, is made of rayon cotton and likewise, it’s soft and comfortable. Both the fillings and the cover are hypoallergenic, and dust mite and bacteria resistant. Thereby, if you suffer from allergies, then you won’t be affected during your comfortable and painless night’s sleep. 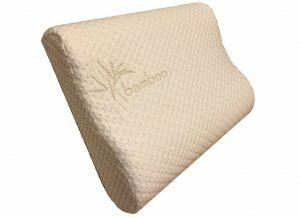 Generally, this is an excellent buy for anyone looking for a versatile pillow to reduce neck pain. A pillow that can provide sufficient head elevation and neck support whether you are a back sleeper or side sleeper. When it comes to choosing a pillow for neck pain, there are certain factors you need consider to ensure that you pick the best option not just for your money but also for your exact needs. Below we’ve highlighted some of the key things you should keep in mind. All this information is vital when evaluating different options and should help you make a more informed decision when making your purchase. Which pillow types can help reduce neck pain? 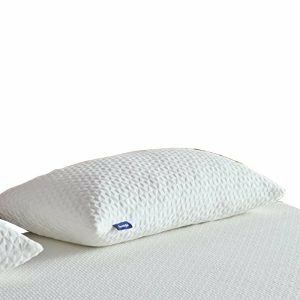 There are all types of pillows on the market, but when it comes to treating or preventing neck pains, then these are the types of pillows you ought to consider. 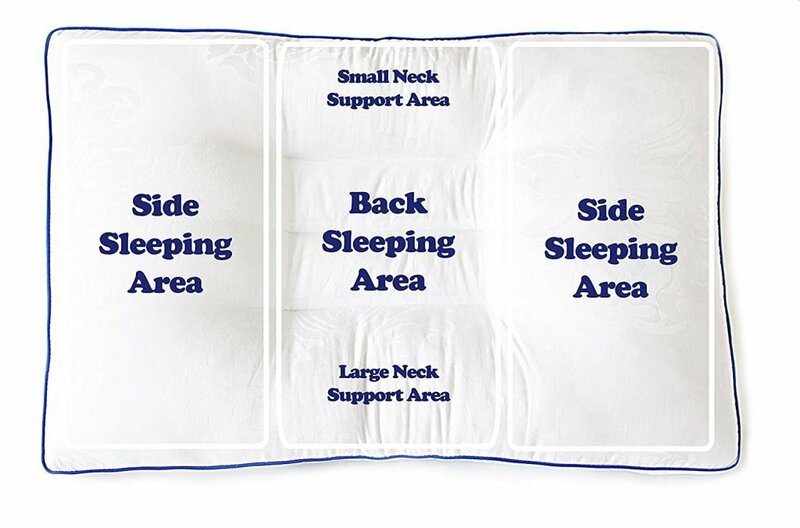 Cervical pillows are designed to maintain the natural curve of your body while providing support to your head and neck. They have a distinct roll shape with a slightly elevated area where the neck rests, and a slightly dip center where the head is supported. Feather pillows are ideal for neck pain as they can easily be molded to fit your neck and head or to offer support where it’s needed. However, if you suffer from asthma or allergies, they might not be suitable for you. Memory foam pillows are some of the most common pillows you will find in the market. They are very effective at reducing pressure points as they are capable of conforming to the shape of your head and neck, holding them in place while you are sleeping. The shape of the pillow you choose will have a significant impact on your comfort and support level. You need to pick a pillow with a shape that can mold as consistent with your head and neck contours. Contoured pillows such as Nature’s Guest and Perform Memory Foam pillow are often a great option for people who constantly experience neck pains because they are able to conform to your body’s natural shape. Traditional curved pillows are also quite effective at providing both neck and head support. 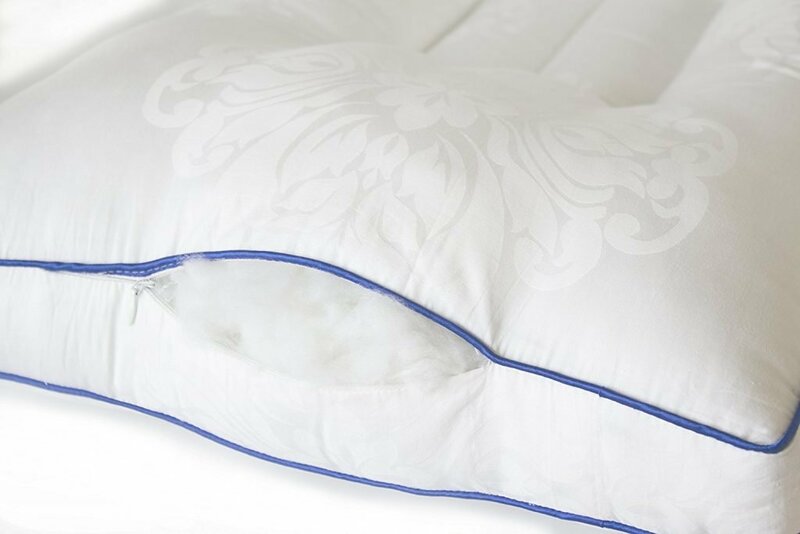 Most of these pillows like the Sweetnight pillow feature shredded filling and are adjustable. They are able to contour according to the shape of your head and neck hence keeping them properly aligned with your spine. If you are considering getting a wedge pillow for your neck pain, then you would want to ensure that it has a gradual slope not steep. In addition to this, the top should be soft and able to conform to the shape of your head and neck to ensure ample support. The Bed Wedge pillow is one such example. There are different materials used for stuffing within pillows. The quality of these materials will determine the softness, firmness and amount of support it can offer. Memory foam pillows tend to be a bit larger and thicker than others. However, when you lay on them, they condense so much and conform and adjust to your body’s shape. Compared to the other materials, particularly memory, latex is much firmer. However, it compresses easily and thereby adapts well to the body’s contour. This makes it an ideal pillow for back pain and neck stiffness relief, since it can help with neck and spine alignment. Sleeping position is another major factor to consider in picking the best pillow for neck pain. Basically, different pillow design will suit different sleeping positions. If you are someone who often sleeps on their back, then you would need a medium thick pillow. A thinner pillow will have your head sink far back while a thicker pillow would push your head too far forward, both which are really uncomfortable and restrict your spine from aligning correctly. If you’re a side sleeper, then your neck and head should align straight over the shoulders like they would when standing with good posture. In this case, a thick and firm pillow would offer the best head and neck support to keep your body properly aligned. If you’d like a pillow a for stomach sleeper, then you want to look for soft and very thin pillows so that you don’t end stretching your neck too much and get uncomfortable. Finally, if you often change positions while sleeping, then you would want to get a contoured pillow like Nature’s Guest or Perform Memory Foam pillow. If you pick something that’s too soft or too firm, then your neck and head might not get the amount of comfort and support needed to keep them aligned with your spine. Therefore, you need to choose a pillow that’s neither too firm nor too soft. It should have a well-balanced filling that’s capable of providing a soft yet sturdy support. To ensure optimal comfort, you should pick a pillow cover that has a soft texture either derived from bamboo fiber or made from cotton. Polyester covers are also quite comfortable and durable. You want to ensure also that the cover is breathable so as to allow sufficient airflow. 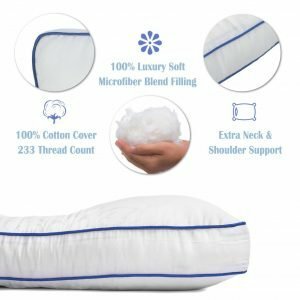 Considering that some of the top pillows for neck pain come with a higher price tag you would want to make sure you pick one that comes with a good warranty. Not all pillows can meet the quality that they purport to have, so selecting one with a good warranty will give you time to assess the quality and effectiveness of the pillow. While evaluating the pillows you are selecting, ensure they have certifications for the materials used. 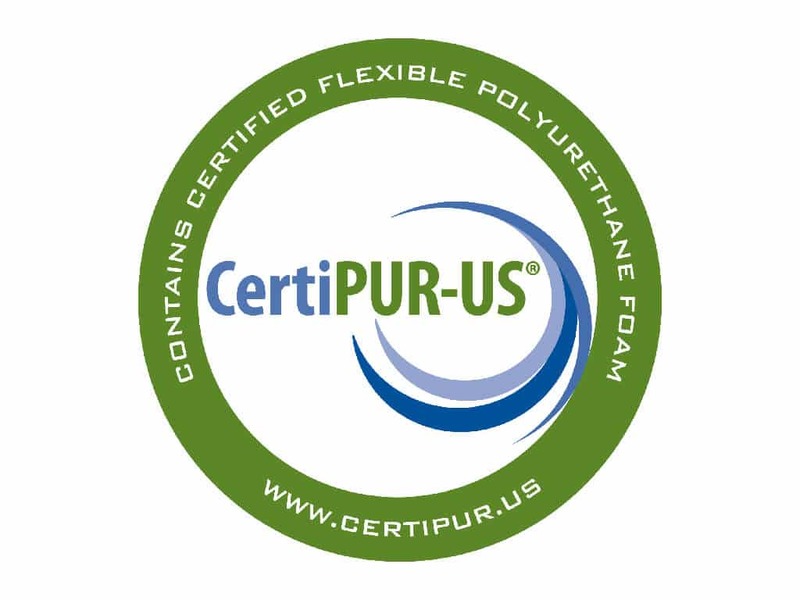 One of the things you should be on the lookout for is the CertiPUR-US seal or if the pillow uses a CertiPUR-US certified foam. By checking the certification, you will be able to make sure that the pillow you select is up to the right standards. Some pillows like the Sweetnight come with a free bag for storing the removed fillings allowing you to keep them away from children. This is an option you might want to consider because it can also help prolong the life of the foam and you pillow. You also want to make sure that the pillow you pick and its cover can be washed easily. Pillows made from synthetic filling such as polyester and some shredded memory foam pillows are usually machine washable hence cleaning is much easier. How to adjust my pillow to different sleeping positions? There are several different ways you can make adjustments to a neck pillow to suit your preferred level of firmness and comfort. 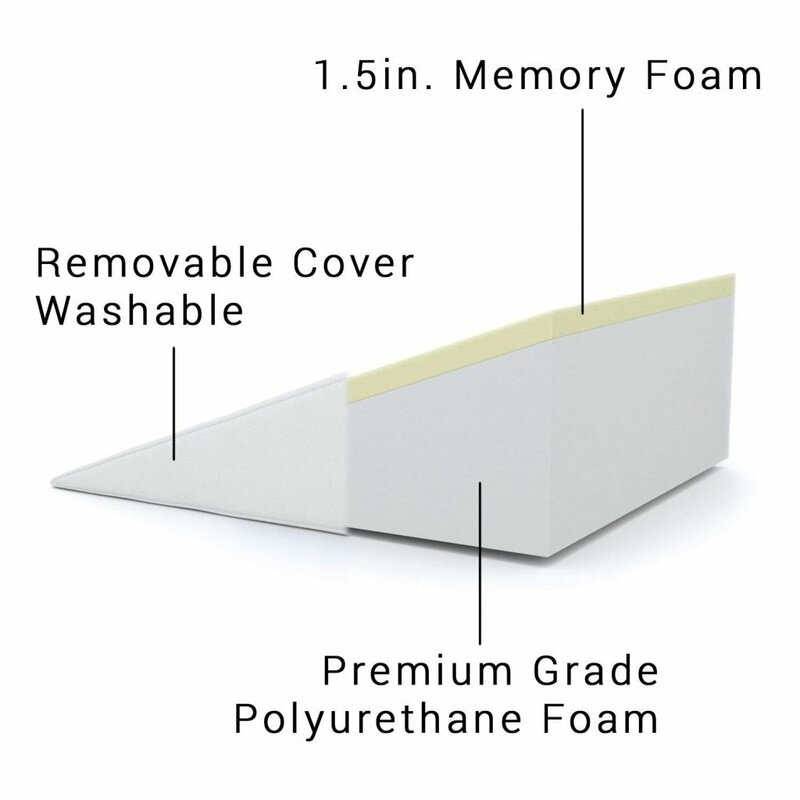 You can add or remove some fillings to the pillow like in the Sweetnight Shredded Memory Foam pillow. Another easier way is choosing the right contour or side. There are pillows such as the Perform Memory Foam pillow which can allow you do this. They are double contoured and allow you to pick the side that’s more comfortable to your sleeping style. Removing a layer of the foam is also an easier way of adjusting a pillow. Some pillows come with three different foam layers where you can remove the middle layer to reduce the height. A good example is the UTTU Sandwich pillow. What is the best sleeping position to reduce neck pain? 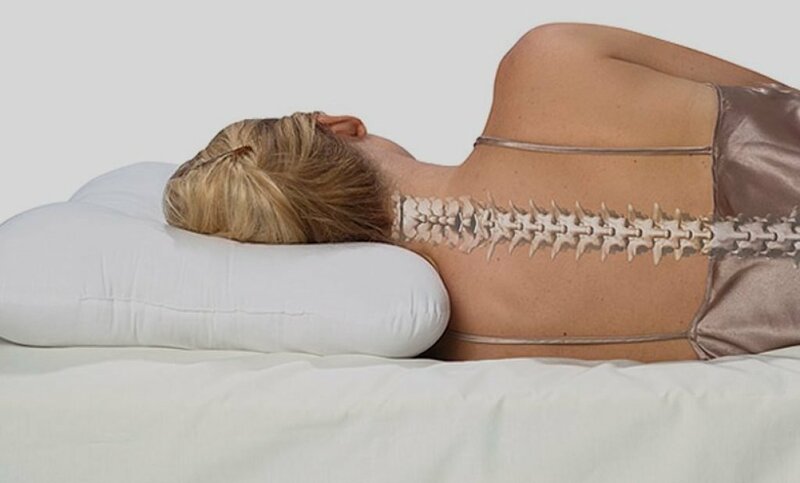 Your spine should be straight while still maintaining its natural curve when you are sleeping. This is the proper posture that can help reduce neck pain. Two sleeping positions that can help achieve this posture and be much easier on your neck are side and back sleeping. When sleeping on the back, you need a pillow that has a contour that will support your neck’s natural curve with an indentation to hold the back of your head. When sleeping on your side, your neck and spine should be aligned straight. Therefore, you will need a thick pillow which is higher under your neck compared to your head. This will allow your shoulder to tuck slightly under the pillow and as such provide the best support possible. 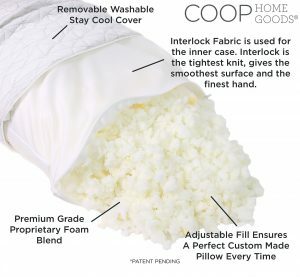 Coop Home Goods is currently the brand that offers the best deal when it comes to neck pillows. This pillow reviewed above comes with a five-year limited warranty and 60-days money back guarantee. UTTU is another brand that offers quite an accommodating warranty. Their UTTU Sandwich pillow is also backed with a five-year limited warranty. Neck pains are relentless, and without proper support, while sleeping, they won’t go away on their own. Therefore, you need to invest in a great ergonomic pillow that will not only help reduce your neck problems, but also allow you to sleep much better during the night. 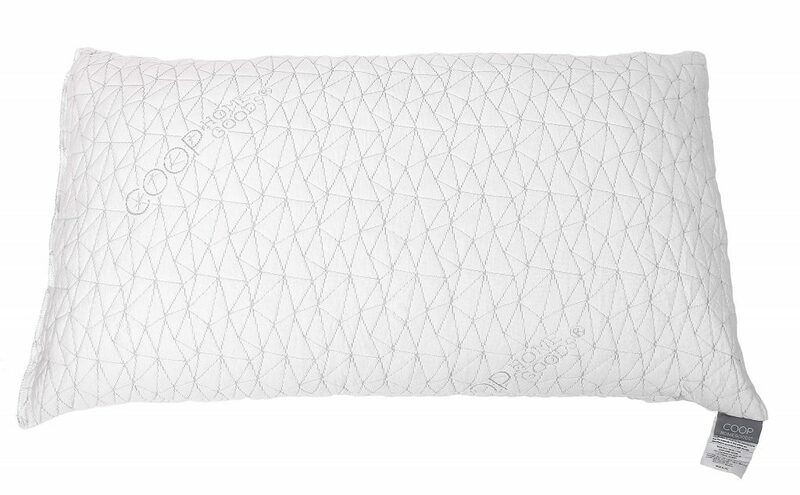 In our list above, Coop Home Goods pillow is the top pick. With its traditional form you don’t need to get used to it, and it suits practically anyone. Filled with shredded viscoelastic memory foam it allows you to adjust it to any level of firmness regardless of which one you prefer. Nature’s Guest Cervical Support Pillow is our runner-up. With its revolutionary contoured shape which also includes an in-built neck roll cushion to fit back sleepers it is also ideal for side sleepers as its sides are perfectly contoured for this position. 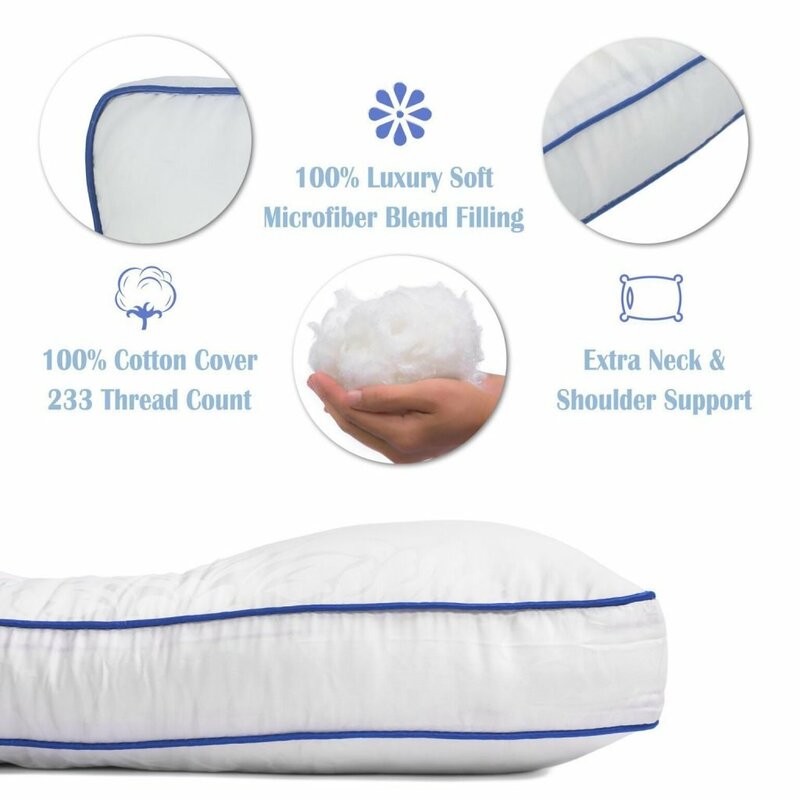 Overall you get a fully versatile pillow to reduce your neck pains. Our third pick is UTTU Sandwich Pillow. It’s highly supportive pillow which also provides you with some soft feel – thanks to its 40% bamboo fiber hypoallergenic cover material. However, they are not the only ones that can help reduce your neck pains. The other four options are equally reliable and comfortable too. Therefore, it’s a matter of picking the one that’s most suitable to you and fits your budget.